VP Rucina chaired the meeting in the absence of President Philip and PE Allan. Rich told us about the ceremony that recently marked the completion of the distribution system of the 15th water project in NW Bali. Water is stored in a 3300L tank and piped to 178 families which average 7 children each, so extended families of at least 10 people each for a total of almost 1200 people. The water is piped uphill with the help of several pumps. The well has the capacity to support another 40 families and next week the project will be expanded to serve them. About 15,000 people have been given water since the project began. Rich received a nice round of applause for all his hard work helping the Balinese people on the arid north coast. Dr Graeme McCrae has been doing research in Bali for over 20 years. He first visited Ubud in 1997, spent 18 months researching here in 1993-6 and has visited for a month or two most years since. He spends most of his time trying to catch up with what’s going on and trying to make sense of it. 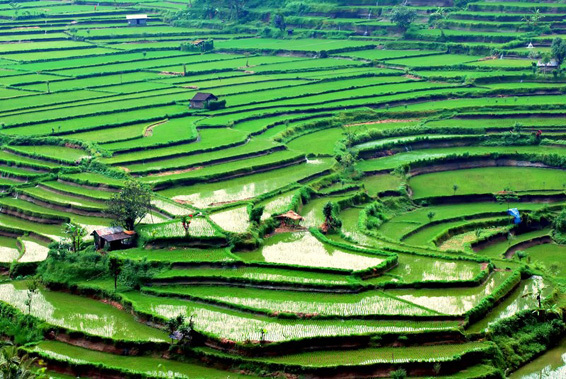 Recently that includes UNESCO’s inclusion of the “Cultural Landscape of Bali Province: the subak system as a manifestation of the Tri Hita Karana Philosophy” (http://whc.unesco.org/en/list/1194) on their World Cultural Heritage list. It’s a big thing for Bali, and it should be a good thing, but is it working? And if not why not? And what needs to be done to fix it? He spoke about the UNESCO World Heritage listing/the (intangible) Cultural Landscape of Bali Province which was approved in 2012 after four unsuccessful applications. The listing includes Tabanan, Batur, Mengwi and Tampaksiring, integrating traditional rice fields, temples and the water systems, all managed by the farmers. Within a year there were problems in Jatiluwih, including floods of tourists and investors, lack of management and the failure of the governing body to conserve the site or compensate the farmers. The WH committee came to evaluate the situation in 2014 they wrote to the government of Indonesia Ministry of Culture, noting with concern that development was taking place and urging the government to follow the protocols. This warning could precede delisting, which would be an international embarrassment. January 2015 the government wrote back assuring the WHC that the issues were being addressed, but in fact they are not. The site at Tampaksiring it is being better managed and the farmers are better supported and compensated. Two men, Wayan Windia and Masril Kota, are now the last remining laisison between government, UBESCO and the farmers. The best solution would be to create local governing bodies which could better make locally beneficial solutions. There was no raffle draw.